World War I Collector - WW1/WW2 Memorabilia Collection - Mellor, Thomas W.
PFC Thomas Walter Mellor was born July 2, 1924, presumably in New Jersey. A copy of his birth certicate shows he was born to Eli Mellor and Claire Walter but he had a guardian by the name of Mattie R. Bradenburg. who had taken him in at age 10 days. Mellor enlisted in the Marine Corps on December 13, 1941 in Philadelphia as he resided in Riverside, New Jersey, not too far from that city. He was only 17 when he enlisted, so had permission signed by Mrs. Brandenburg to do that. His National Archives file shows that the Government refused to pay his life insurance to Mrs. Brandenburg, who raised him, because he was never legally adopted. Mellor's first duty station after training was with the Marine Detachment, Naval Magazine, Coco Solo, Canal Zone until April 1944. On May 3, 1944, he is shown as a passenger on the USS Antaeus, AG-67, probably returning to the east coast. He then went to Camp Elliot in San Diego for training with Co. F, 2nd Bn., 29th Marines. Sometime after August, 1944, he would then have gone to Camp Tassafaronga, Guadalcanal for intensive training with the 6th Marine Division. The Sixth with a complement of 24,356 Marines was assigned to invade Okinawa and that invasion date was on L Day, April 1, 1945. PFC Mellor was KIA at age 20 on May 19, 1945 on Okinawa, and was initially buried there in the Division Cemetery No. 1 in Ryukyu Retto. He was reinterred at Plot M Row O Grave 105 at the Honolulu Memorial, Hawaii in 1949. His date of death coincides with the action at Okinawa battle for Horseshoe and Sugar Loaf Hill near Shuri Ridge with F/29 of the 6th Marine Division. Note that Mellor was not a reservist, but a regular Marine. Thanks to a fellow collector, we now have Mellor's Casualty card showing he died of multiple wounds. It also shows that his foster mother asked that he remain buried overseas. 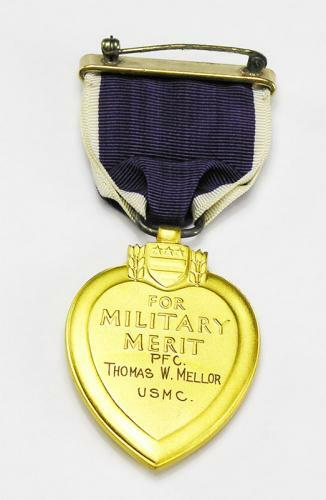 PFC Mellor's officially engraved posthumous Purple Heart is a Type 2 medal with a solid brooch. This medal comes with the official Navy short titled case. "On May 18 tanks provided the key to a successful assault of Sugar Loaf. Despite mine fields and accurate AT fire which claimed six tanks, a company of mediums reached positions on each flank of the hill from which they could cover the reverse slopes. Company D of 2/29 advanced with the tanks and made a double envelopment of the objective. At 0946 the assault platoons reached the top of Sugar Loaf and held their ground despite a fierce grenade and mortar duel with the enemy defenders. The attackers soon moved over the crest to mop up and destroy the caves and emplacements on the south slopes. Deadly mortar fire from covered positions in the Horseshoe blanketed Sugar Loaf, and Company D dug in at about 1300 to hold its gains. Lieutenant Colonel Robb committed Company F on the right of the battalion zone to reduce the Horseshoe defenses. Supported by fire from the troops on Sugar Loaf and 1/22 on its right, Company F reached the ridge that marked the lip of the Horseshoe depression before it was halted by an intense mortar and grenade barrage. The company withdrew slightly to the forward slopes of the ridge and dug in a strong defensive position for the night. By nightfall on 18 May the combat efficiency of the 29th Marines had been seriously impaired by its fight for the Sugar Loaf position. The 6th Division had suffered 2,662 battle and 1,289 non-battle casualties since the start of the Tenth Army attack, almost all of them in the ranks of the 22d and the 29th Marines. A fresh unit was needed to continue the attack with undiminished fervor and General Geiger released the 4th Marines to General Shepherd at 1830. The 29th Marines was to become division reserve subject to IIIAC's control. The attack plan for 19 May called for the 2d and 3d Battalions of the 4th Marines to relieve the 29th and consolidate the gains of the previous day's fighting. At 0300 the Japanese counterattacked the open right flank of Company F of 2/29 on the edge of the Horseshoe depression. The enemy assault, supported by a heavy bombardment of white phosphorus shells, was strong enough to force the leading elements of the company to withdraw to the southern slope of Sugar Loaf. At daybreak Companies K and L of 3/4 began relieving the units of 2/29 on Sugar Loaf, while Companies F and E of 2/4 took over the rest of the 29th Marines' front. The reliefs were effected smoothly despite the difficult terrain, steady bombardment, and opposition from small enemy groups which had infiltrated the lines during the night. Some advances were made along the regimental front as assault companies seized the most favorable positions from which to attack on 20 May."